German researchers have provided scientific proof to the common belief that stress can cause headaches.The study presented at the American Academy of Neurology's 66th Annual Meeting has found that high stress levels can cause increased episodes of headaches. Four times a year for two years 5,159 people aged 21 to 71 answered questions about their headache type and frequency and rated their stress levels on a 100 point. 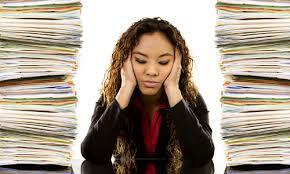 An increase in stress was associated with an increase in the number of headaches per month. For those with tension headche,each 10 point increase on the stress scale was associated with a 6.3 percent increase in the number of headache episode they had each month. Migraine sufferers had a 4.3 percent increase in the number of headaches per month and those suffering from migraine combined with tension headaches had a 4 pet cent rise. "The results add weight to the concept that stress can be a factor contributing to the onset of headache disorders, that it accelerates the progression to chronic headache,excerbates headache episodes,and that the headache experience itself can serve as a stressor". According to the study author,frequent headache sufferers should adopt stress management strategies such as meditation and yoga.